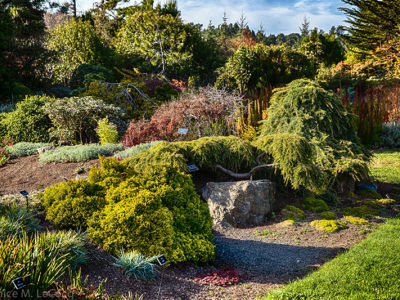 Mendocino County, CA is a favorite spot for tourists, with its dramatic coastline, the sweeping vistas and thundering waves of the Pacific Ocean and the iconic stands of ancient redwoods. 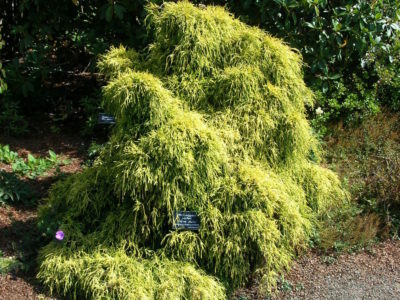 It is also a great spot for plant lovers, as its climate is exceptionally mild and moister in summer than most of the state. 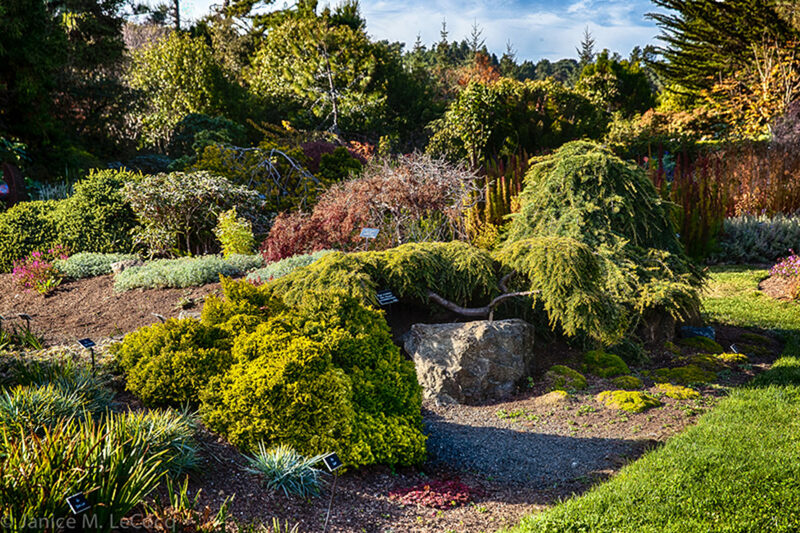 The Mendocino Coast Botanical Gardens, which Sunset Magazine ranked #2 in 2013 of public gardens in the Western States is perched on the coastal headlines and is the perfect destination for visitors of all interests. 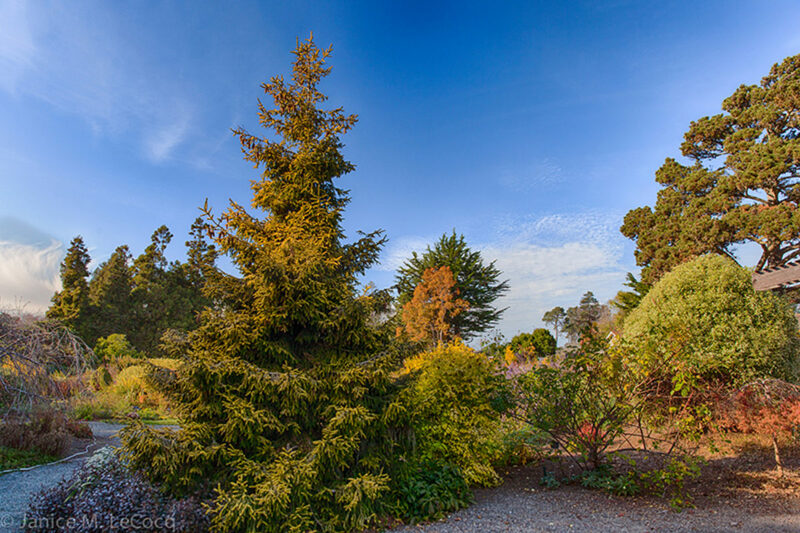 The MCBG also has an extensive conifer collection, and in late 2013 became a Western Region Reference Garden. 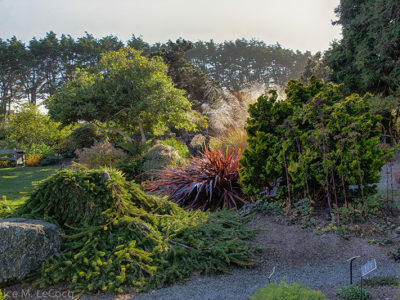 The Gardens’ first notable collection was rhododendron, reflecting both the unique growing conditions and a resident population of horticulturalists engaged in hybridizing many of the most popular early introductions. 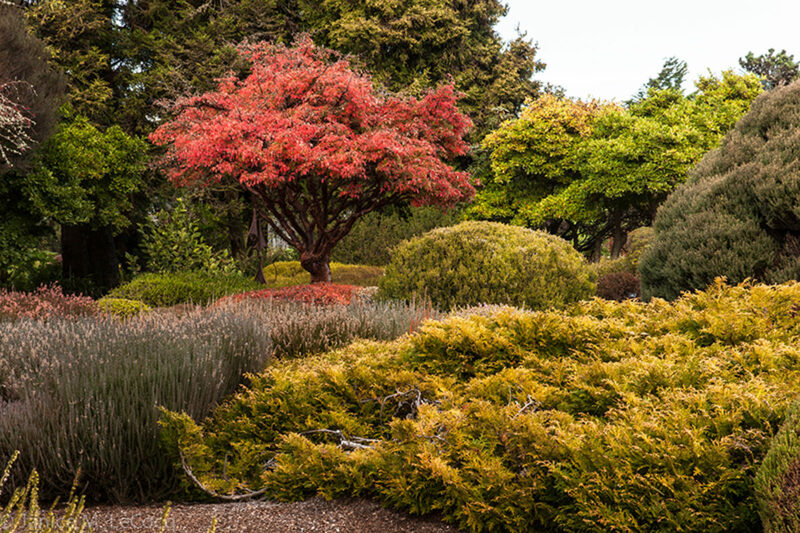 Today the MCBG is still known for these beautiful shrubs and it is one of the few places in the world where every kind of rhododendron can be grown, including many tender species from the cloud forests of Southeast Asia and the Himalayas. 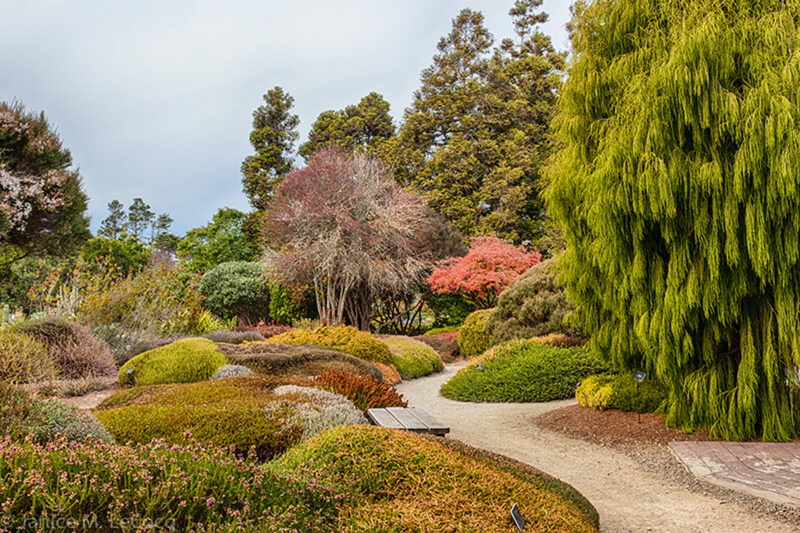 Every May the MCBG and the Noyo Chapter of the American Rhododendron Society host the largest Rhododendron show in California, when the majority of these shrubs are in glorious bloom. 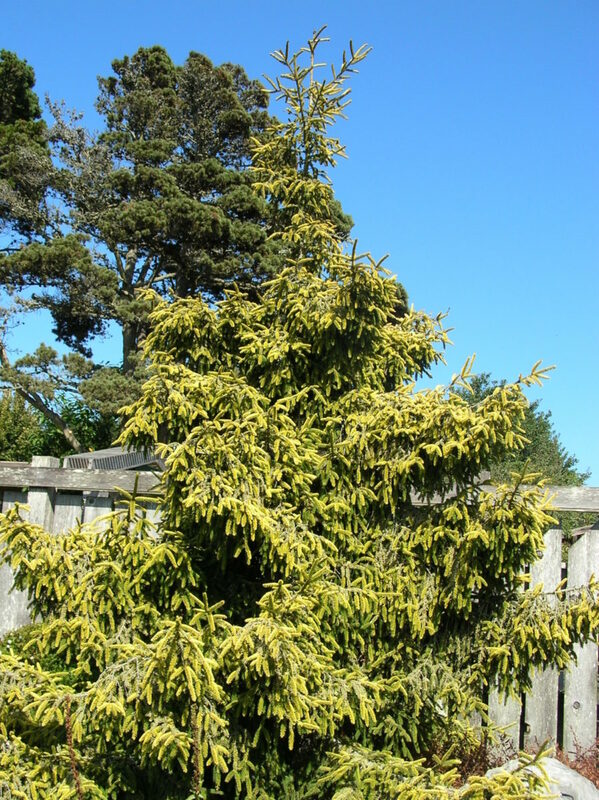 Conifers were also part of the MCBG from its beginnings, as the native stands of Pinus contorta(shore pine) provide a crucial windbreak to the Gardens from the prevailing westerlies off the ocean. 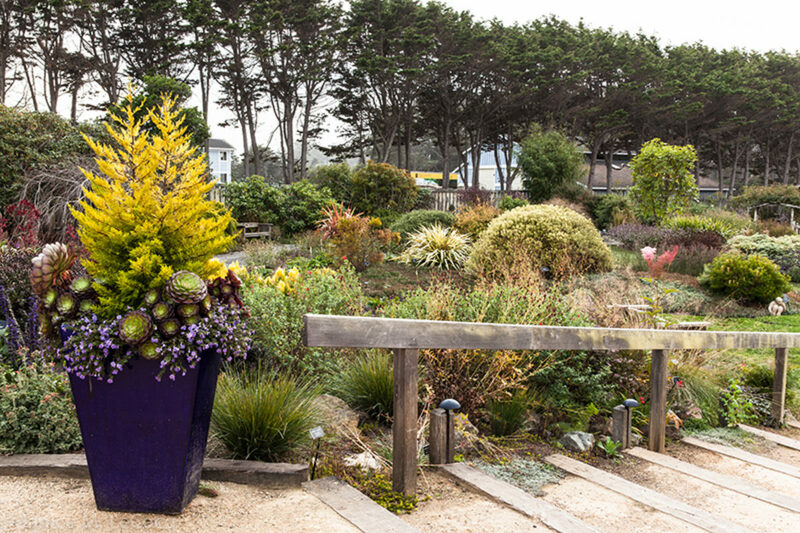 The first efforts involved replenishing and adding to those trees along the shoreline. 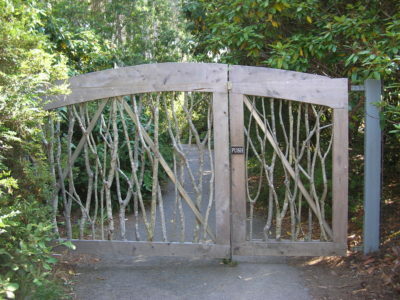 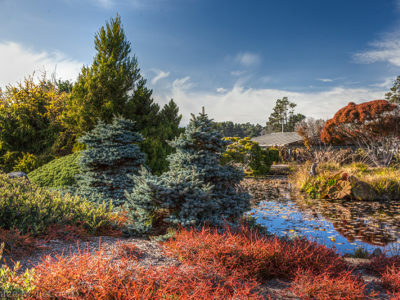 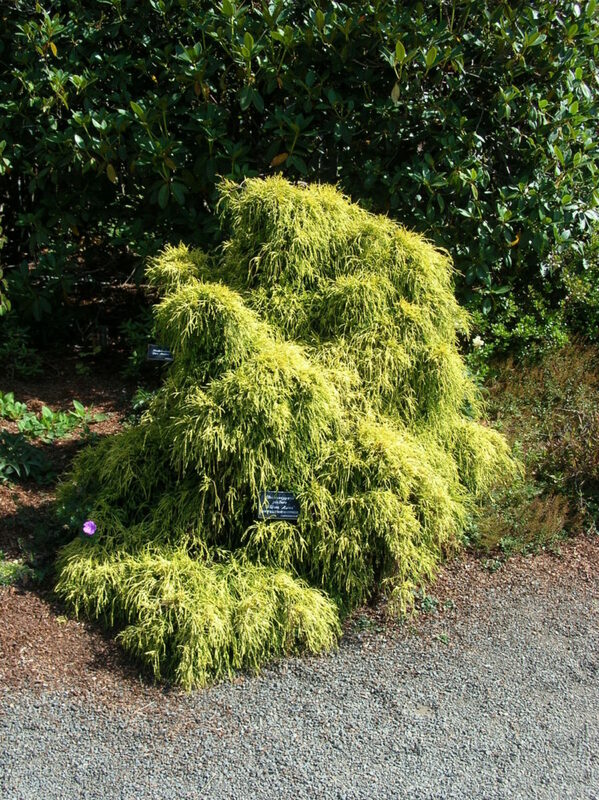 Today, the Gardens total 47 acres and the conifer collection includes natives, rare and unusual species from the world’s temperate regions, and also interesting dwarf and miniature cultivars that are planted both in conifer-centric beds and interplanted with perennials and other woody plants. 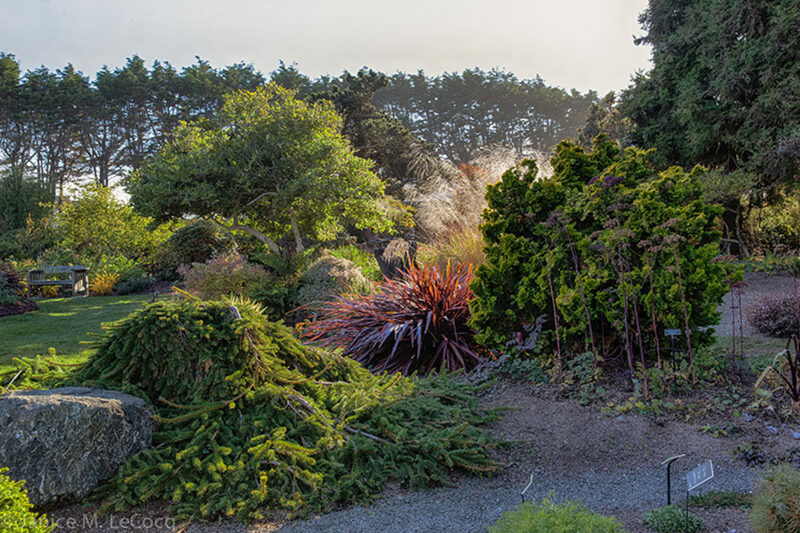 about 50% of the Gardens are maintained in their natural state, which affords visitors the opportunity to experience both carefully cultivated plantings and the scenic woodland with towering native trees and lush undergrowth. 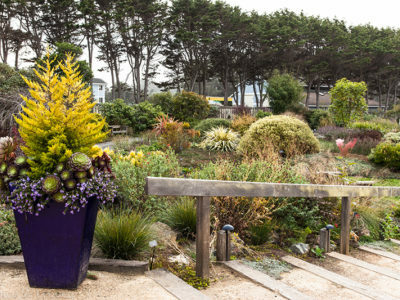 These ‘wild’ areas are managed to protect both native flora and fauna. 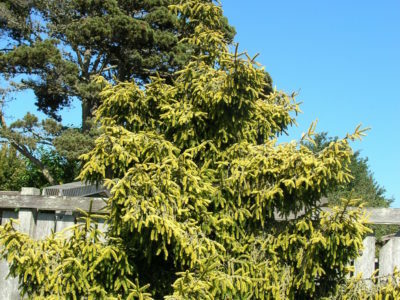 There are plans for expanding and enhancing the Gardens’ conifer collection. 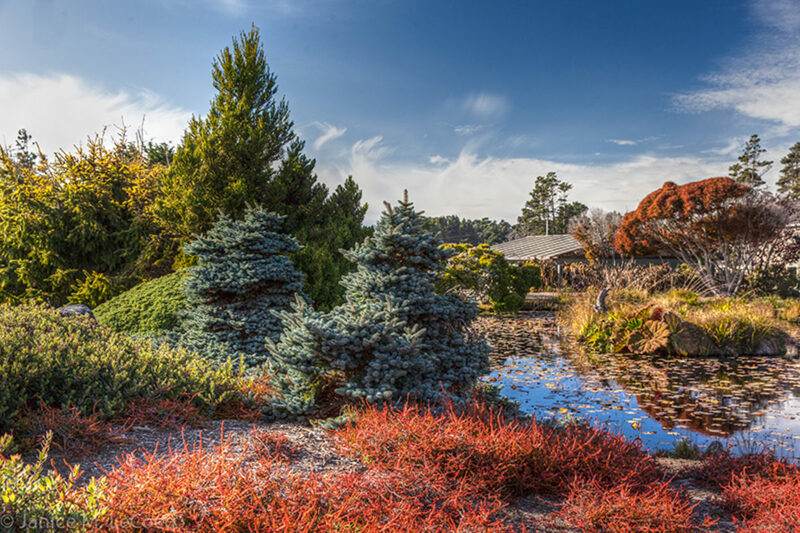 Director Molly Barker is a fan, ‘Conifers provide winter interest in our perennial beds and year-round curb appeal in our problem entry area, which is open to deer, exposed to the reflected heat of the parking lot and is extremely windy. 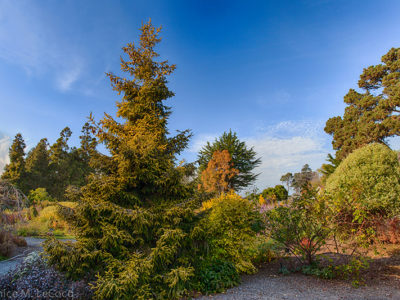 The conifers take the abuse and still look great!’ She notes that the entry beds are currently being renovated, ‘Our goal is to make the entry garden reflect the Gardens’ overall collection, as this is the first bed that our visitors see when they arrive, and it’s a great introduction to these wonderful plants.’ There are also plans to add pathways and conifer cultivars to the Woodland Garden. 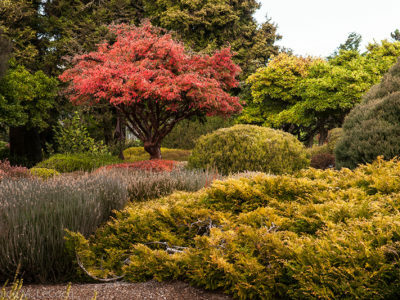 The Nursery at the MCBG sells a large diverse selection of dwarf and miniature cultivars, many of which can be seen planted in the various gardens. 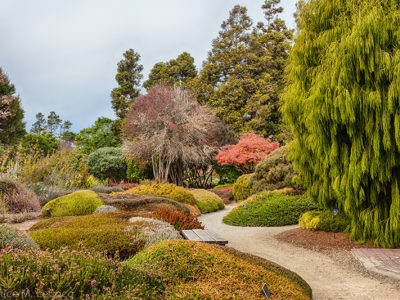 In addition to the rhododendron and conifers, the Gardens have significant collections of heaths and heathers, camellias and magnolias and native upland and riparian plants of the North coast. 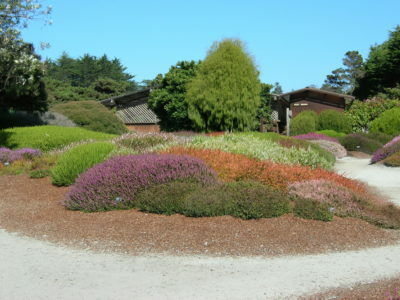 The heaths and heathers collection is recognized by the American Public Gardens Association. 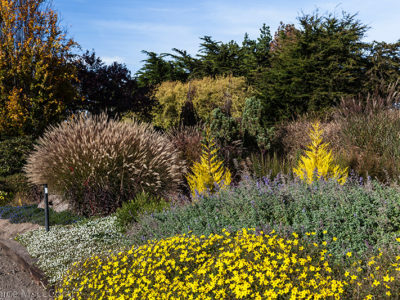 There is also an astoundingly colorful dahlia display in autumn. The Gardens were part of the September 2015 ACS annual meeting post-conference tour. 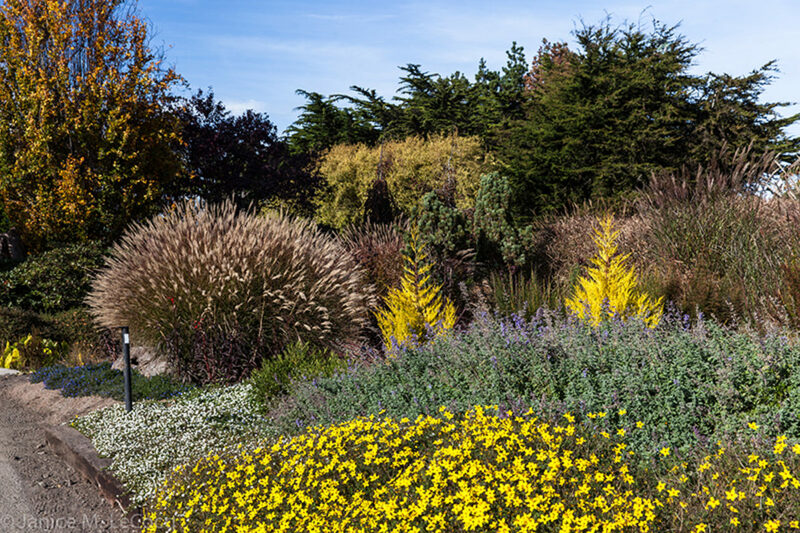 Read more about the MCBG on the Form and Foliage blog and on the Gardens’ website.